It’s hard to believe that The Frequency is already celebrating 9 years! This year’s Birthday Weekend features two nights of music, but Saturday June 10th’s lineup features some new Pop-Punk from Nashville. 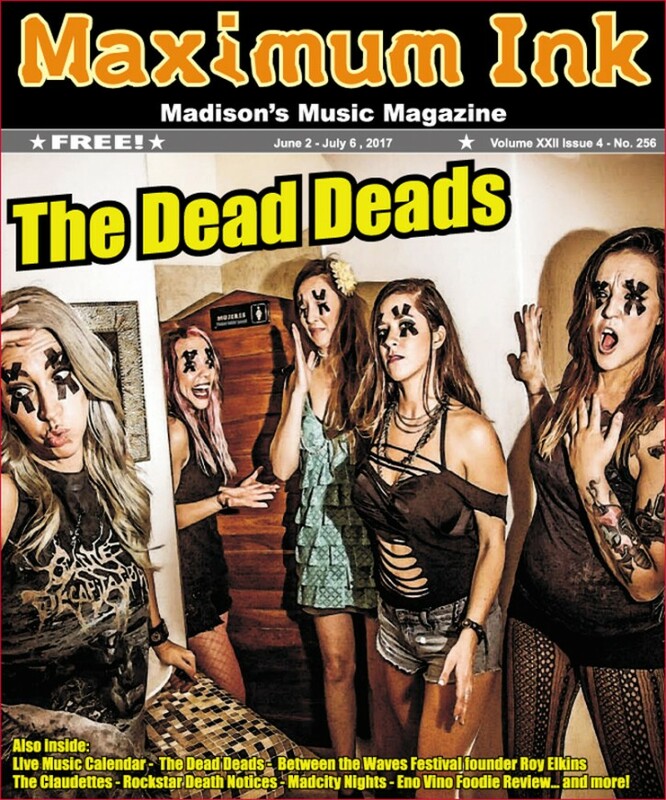 Four girls with X’s over their eyes, with MISFITS-style chants at a breakneck pace, THE DEAD DEADS feature Meta on lead vocals and rhythm guitar, Betty on lead guitar, Daisy on bass, and Billy on drums. And of course, their last name is all DEAD. We talked with Billy Dead about their new album, their influences, and their upcoming show at The Frequency on June 10th. MI: So, why did you guys decide to become musicians? BD: We all grew up around music. Some of our parents sang or played piano, my family worked at a music shop and played in a band, some of us played other instruments in high school bands, etc… And we had the support and encouragement from our families. MI: Who were the bands that you all listened to that you wanted to emulate? BD: We pretty much grew up in the 90s during our formative years, so many of our favorite artists include NIRVANA, MELVINS, PIXIES, NOFX, WEEZER, MASTODON, etc… Since we’ve only been a band for a little over 3 years, our most recent and main influence might be HALESTORM. They took us out on our first national tour, and we were constantly inspired by them, on and off the stage. MI:What’s the band name all about? BD: We originated as a DEAD MILKMEN tribute band and we wore black X’s on each eye representing being dead (like old cartoons). That look stuck, so when we wanted to continue as a band and write our own material, the “dead” part stayed. And there’s so many bands that are The Dead something’s or The something Deads, that we just went with THE DEAD DEADS Also, the website wasn’t taken yet, haha. MI:What’s the first DEAD DEADS song people should be listening to? BD: That’s tough because each of us is influenced by different music, and it shows in our songs. Off of our first record Rainbeau, we recommend “The Lonely Sound”, “Lemonade” and “Nope”. Off of our most recent record For Your Obliteration…, we recommend “Blackout”, “Animals” and “We Are Kings”. MI: What are you guys inspired by? BD: Let’s take our most popular song, “Lemonade”. The inspiration behind that is a broken relationship, but you can’t stay away. You keep going back to the love(s) that continue to bring you down. Very relatable, haha. MI: You guys have been on tour a lot lately, what’s been your favorite shows? BD: Our last show with HALESTORM in Baton Rouge in late 2014. The venue was packed and we joined HALESTORM on stage for “Daughters of Darkness” (we did that a few times actually). What a dream! We were one of the headliners at Riverbend Fest in Chattanooga during the summer of 2015. We played to a record crowd, and that was one of our hometown crowds, too. We were also blessed with playing on the last Motorboat Cruise and met MOTÖRHEAD. We got to see Lemmy perform one of this last shows (during a hurricane in the Bahamas, mind you)…and being around that kind of talent was really humbling. None of us will ever forget that. MI: What’s The Frequency show gonna be like? BD: A lot of fun and weirdness and dancing and sweat haha. We work just as hard on stage as we do off stage, and we sort of take the audience to a whole new place with us. Heavy grunge riffs, a wall of sound, harmonies, growls and head banging. It’s a party and we are STOKED to play Wisconsin again! It’s been three years… our newest album will be available at the show, and we’ll hang out with the crowd before and after - come say hi and party with us!